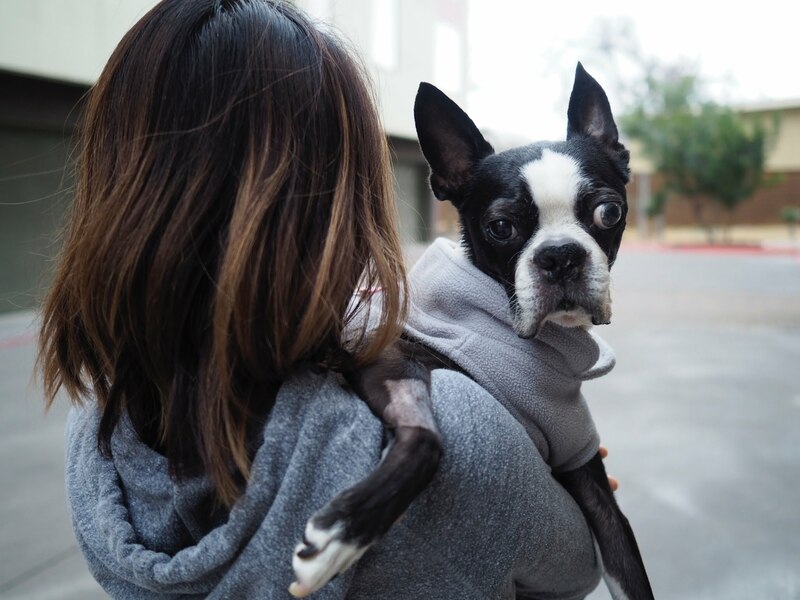 The following is an account of what led up to a cystic meningioma brain tumor diagnosis in our 13-year-old Boston Terrier, Jack. By sharing our experiences we hope other dog owners can spot some of the early signs and get treatment for dog brain cancer before its too late. On December 8, 2017, our beloved dog, Jack, experienced an unusual spasm (which in hindsight, we realize was a seizure) in the middle of the night while sleeping in our bed. We’re not sure how long it went on for, but by the time we woke up, we found him tangled in the sheets, flailing back and forth. He was completely wrapped up, like the meat inside of a dumpling trying to escape its wrapper. After a panicked 10 seconds of trying to free him, we were able to extract him from the overlapping layers of fabric. By this time, he was panting extremely heavily (perhaps hyperventilating?) and his tongue and lips looked very pale. Clearly overheated, we gave him a cold shower. After 15 minutes he stopped panting, but he was a bit shaky on his hind legs and acting a little strange, so we took him to the vet a couple of hours later. After performing and reviewing X-rays, the vet found evidence that he might have a bulging disc in his spine, which is typical of his age. Also, upon looking at his joints, she also found signs of arthritis. The most likely conclusion at the time was that he might have thrown out his back while thrashing around under the sheets. To deal with his back injury, he was prescribed the pain killer Tramadol and the anti-inflammatory, Rimadyl. He slept a lot those first days after the incident as he recovered. Over time, things improved for a while, which was consistent with a back injury slowly healing. He could get around more easily on the Tramadol, but he had a hard time swallowing the pill because of its bitter taste. Getting him to take any pills at all was a challenge, but after a week, we figured out that crushing the pills and adding them to food was the most effective thing we could do. Speaking of food, over time, we noticed Jack becoming pickier with food, often refusing to eat treats he once loved. Also, he stopped greeting us at the door when we came home, but this happened gradually, starting even months before he had his back spasm. In fact, at times he would act surprised when he saw us in the house even though we called his name beforehand, which led us to suspect that his hearing and vision were getting worse (which is common in older dogs). Over the course of a month following the incident, and we started to gradually notice some other weird signs. He started peeing inside the house, which we thought might be due to him not wanting to go out in the near-freezing January cold. And when we did make it out the door, the hairs on his back (the hackles) stood straight up, indicating a pain or fear reaction. Over the next couple of months, things would get gradually worse. He stopped responding to his name being called at all, and vision was getting progressively worse. There were points when he would just walk straight into walls because he didn’t notice them coming as he walked towards them. That said, there were days where he seemed pretty normal, followed by setbacks where he could barely walk at all. One day in January, at about 10AM in the morning, we both watched him violently snap his head back, then urinate on the floor. This was another seizure, although we didn’t realize it at the time. Eventually, by late January, Jack could no longer do activities that were once very simple for him, such as walking down a flight of stairs or jumping up onto the sofa. Some days, he could hardly muster the strength to even squat long enough to poop. While laser acupuncture and chiropractic treatments (yes, you can really get this done on dogs) helped him with the back pain (enabling him to stand again), even when he was feeling good, he had trouble walking straight. It started out as a slight lean to one side, then after a day or two, he started walking in large, clockwise circles. Over the course of a week or so, the circles got tighter and tighter, to the point where he was basically chasing his tail, sometimes tripping over things. Right before his brain cancer diagnosis, his circling and balance was so bad that he couldn’t even stand up straight. When he wasn’t moving around, he was sitting in a slumped over position with his head hanging low and to the right. Often he couldn’t even sit up without leaning heavily against one of us or a wall. Getting to the final diagnosis of a brain tumor was not a straightforward journey. We’ve already talked about the early diagnosis of spinal issues that didn’t fully explain all of the symptoms. We also thought Jack’s decline in health might be due to a whole host of other underlying causes. Only after much Googling and consulting with many different doctors were we able to narrow it all down to a brain tumor. Jack has small cysts in his eyes (they look like tiny gray translucent beads), which is common in Boston Terriers. We were worried that was why he couldn’t see. But the opthamologist (eye doctor) said that he while they were obscuring his vision a bit, he could still see through them. We read about vestibular / old dog disease, which affects balance, and can cause dogs to stumble. This one can clear up on its own, but the neurologist ruled this out based on his other behavior, such as the head hanging to one side, and side-to-side eye twitching that we noticed from time to time. Bacterial meningitis is another possible cause of shaky legs and head tilting, and is treatable with antibiotics. The neurologist mentioned this as a possibility, but this was ruled out by the MRI. While the neurologist strongly suspected that Jack had a tumor, there was no way to know for sure without an MRI. And unfortunately for us, she was correct. When the results of the scan came back, you could see a brain tumor 1.5cm in diameter, sitting at the base of his brain, next to the pituitary gland and regions of the nervous system that control vision and balance. Jack’s MRI on the day of his diagnosis. 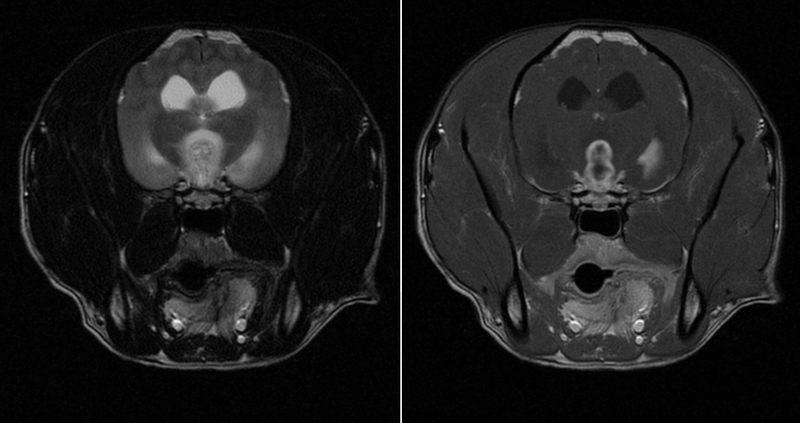 The image on the right includes contrast, which allows you to see the peanut-shaped tumor located next to the thyroid gland more clearly. In our minds, this was the worst case scenario, as there is no guaranteed cure for a brain tumor, and cancer is both mysterious and scary. When the news came back, both of us were in a state of shock initially. But we knew we had to act quickly, as multiple doctors told us that the average survival time for a dog with Jack’s diagnosis is 30 days. This particular type of tumor, cystic meningioma, is resistant to chemotherapy. Additionally, because the location of Jack’s tumor makes it particularly inaccessible without risking damage to the rest of the brain, surgery was not an option. The only recourse for us was to do radiation, which involves shooting high-powered X-ray beams at the tumor in order to damage cancer cells. Cardiologist or Internist, who can verify that your dog is a good candidate for radiation. Jack has a weak heart, so we needed to make sure he could take the repeated rounds of anesthesia that are a part of radiation therapy. Radiation oncologist, who actually performs the radiation treatment. In Jack’s case, he received stereotactic radiation using a Varian TrueBeam machine. This required 6 visits—one for a consultation, plus 5 radiation treatments over the course of a week. More details on that process in our next post.